﻿ Fun Easy English - new classroom free online classes english language lessons speaking listening writing reading december 11. Today in the Fun Easy English classroom you are going to learn "jever" an American English reduction. American English reductions are reduced forms of English words. This American English reduction is formed when you combine and reduce the following words. This American English reduction is used in the following way. Jever want to be an English teacher? This American English reduction has the following meaning. Did you ever want to be an English teacher? Jever want to visit another country? Jever plan to move to this city? Jever plan to be working at this company? Jever want to go hiking in the mountains? Jever eat at this restaurant before? Jever is the way "Did you ever" sounds when spoken quickly. Try it yourself. 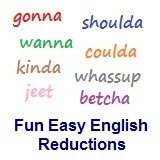 Reductions are reduced forms of English words. Reductions, such as jever are not real words in English. You need to use reductions in order to sound more natural. You need to know reductions in order to understand conversations between native English speakers. Reductions are used extensively in American TV, movies, music, literature, and in conversations among native English speakers.